NEW HAVEN, Mo. - No this not a dream snow really is in tomorrow’s forecast as temperatures will drop 40-degrees on Sunday with winds gusting up to 35 miles per hour. The National Weather Service had issued a Winter Weather Advisory that will go into effect Sunday morning at 4 a.m. lasting until 7 p.m. Sunday night. Please read the entire announcement. 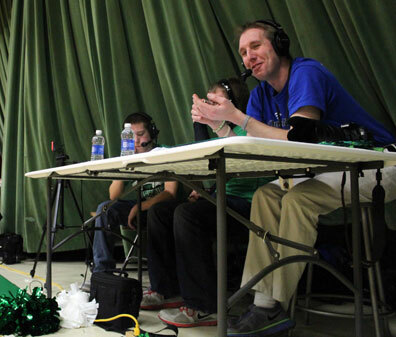 QNN would like to thank the thousands of people who watched our live broadcasts of the Lady Shamrocks over the past two weeks. A special thanks to Michael McKernan and Cameron Pritchett for helping during Districts. We would also like to thank Matt Benz for his help in the State Sectional and Quarterfinal games and most importantly to all of our sponsors who made it possible for Shamrock fans to watch a post season game live for the first time ever. Unfortunately, we will not be broadcasting any of New Haven’s games for several reasons, but have made arrangements so that fans will still be able to listen to the games. NEW HAVEN, Mo. 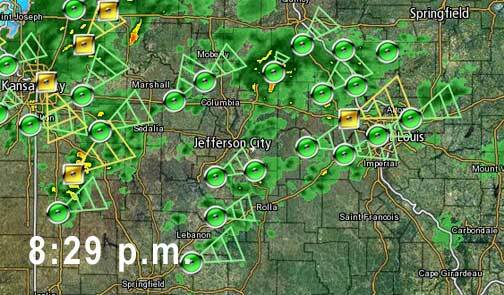 -Storms have already developed over Columbia and are beginning to develop in areas southwest of Franklin County. 6:30 PM - Currently it is a beautiful 78 degrees locally but a drastic change is on it’s way. Over the next 12 hours expect to see spring like thunderstorms change over to snow with minor snow accumulations possible. Pictured is Ron Kraettli of PSB presenting a check to Patti Ryan, organizer of the Riverside Film and Video Festival. HERMANN, Mo. 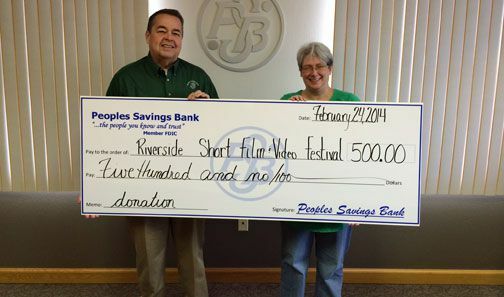 - Peoples Savings Bank is proud to underwrite the second Riverside Film and Video Festival. The festival is scheduled for April 11 & 12, 2014. In discussing the Film Festival, Ron Kraettli stated, “PSB is happy to support this festival. This type of event offers diversity in Hermann festivals and brings more visitors into the community. This type of event brings new visitors and supports all the local merchants who are also customers of PSB”. Partnership is growing services and strengthening the hospital. New Haven, Mo. 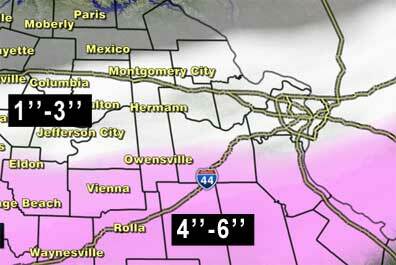 - The National Weather Service (NWS) has now upgraded it’s initial winter storm watch to a Winter Storm Warning, which will take into effect at 6 p.m. this evening and into Monday morning at 6 a.m.
Our good friend at KMBC, Meteorologist Neville Miller has put together a custom forecast specifically for New Haven and surrounding areas and here is an updated forecast as storm slides south. UPDATED: Mar.2 4:32p.m. 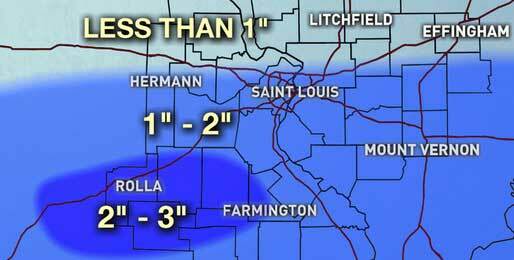 The back edge of the storm will move through over the next several hours bringing possibly 1-2" of snow. Temperatures will drop close to 0° by Monday morning with wind chills -10° to- 15°. 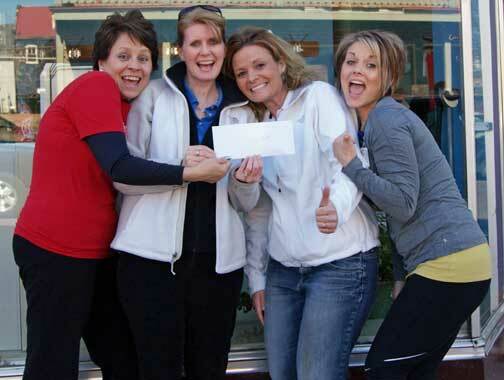 Pictured above is Susan Lenger, organizer of the Red Heart Walk, Susan Stiers and Dawn Grosse, board members of the Hermann Food Pantry, and Manda Rucker of Hermann Fitness Source are super excited about another successful Red Heart Walk event. Hermann, Mo. - Last Friday was the 7th year HADH and Hermann Fitness Source have sponsored the “Red Heart Walk” event as a way to promote Heart Health. Over 57 participants turned out on Friday helping to raise $530 through the generosity of local businesses and members of the community. 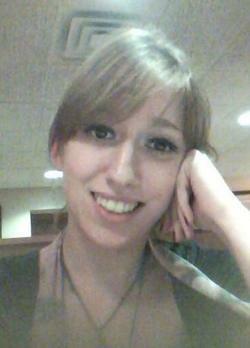 Miss Casey N. Bulinski, 20, of Arnold formerly of Hermann passed away Monday, February 17th, 2014 at St. Anthony's Medical Center, St. Louis, Missouri. Miss Bulinski was born in St. Louis, Missouri, on July 28, 1993, the daughter of the late Buanita (Schlatt) Englert and Joseph Bulinski who survives her of Arnold, Missouri..
She worked as a waitress at TGI Fridays in St. Louis, Missouri. Casey enjoyed hanging out with her family and friends, spending time with her nieces and nephews and playing softball and soccer. 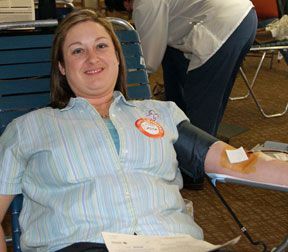 Pictured is Denise Williams with Peoples Savings Bank, she is donating Double Red Cells at the blood drive. Herman, Mo. - Thursday, Feb 13th's blood drive was sponsored by Hermann Area District Hospital Auxiliary and held at People’s Savings Bank-Rhineland where 55 pints of blood were collected. They surpased their goal by 13 pints! Each pint of blood can be divided into three components—red cells, platelets and plasma—giving our blood drive the possibility of impacting 165 lives. While it is impossible at the time of donation to know how that specific donation will be used, there are more uses for blood than many people realize.